This Judge Received Special Treatment After Beating His Wife. Then He Killed Her. In 2014, Lance Mason, a Cuyahoga County Judge, slammed his wife Aisha Fraser Mason's head into the dashboard of their car, bit her face, punched her so hard he broke her eye sockets and then left her on the side of the road, driving away with their two young daughters in the backseat of the car. On the day his punishment was handed down, the prosecutor Maggie Troyer told the court, "I think this would be an example of sometimes how good people make bad decisions or do bad things." Ohio Representative Marcia Fudge wrote a letter on behalf of Mason, her friend for over 20 years, who'd beaten Aisha Fraser Mason so severely she required facial reconstructive surgery. "The Lance T. Mason I know is a kind, intelligent man and loyal friend," it read. 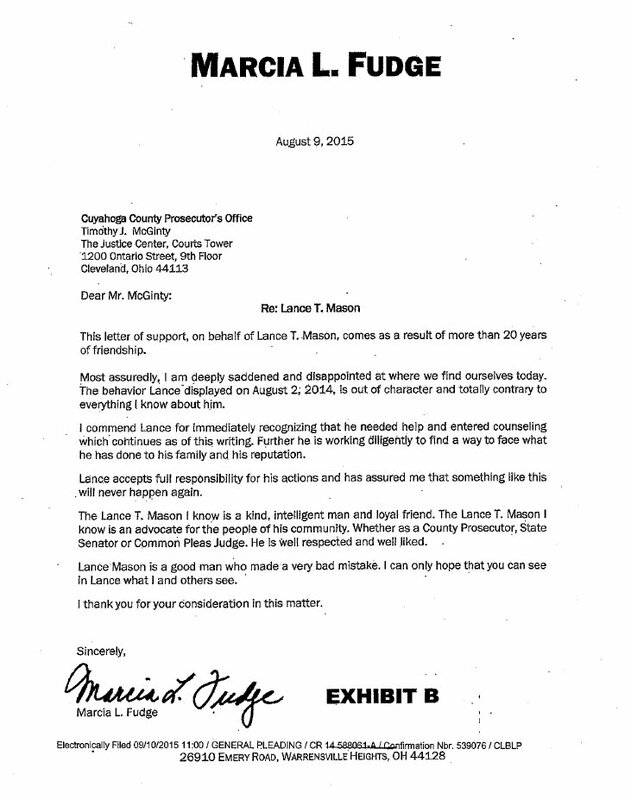 "The Lance T. Mason I know is an advocate for the people of his community. Whether as a County Prosecutor, State Senator, or Common Please Judge, he is well respected and well liked." When Mason was released from prison after serving only 9 months of his two year sentence, his friends and colleagues stepped in to help him out. In 2017 he was handpicked by Cleveland Mayor Frank Jackson to be the city director of minority business operations. And on Monday, the honorable former judge, prosecutor, and member of the mayor's administration was arrested for allegedly stabbing his estranged wife to death in the driveway of her Shaker Heights, Ohio home. Police found the body of 44-year-old Aisha — a sixth-grade teacher — after responding to a domestic violence call. In attempting to escape Mason rammed his vehicle into a police car injuring an officer and himself. Soon after his arrest, he was fired from his position in the mayor's office. In a press release, Mayor Jackson said, "I extend my deepest condolences to the family of Ms. Aisha Fraser [Mason], especially to her children." However in an interview, Jackson walked back that sentiment, saying “We did nothing to see if he was rehabilitated." And later, “No, I am not apologizing to the family. I will tell the family I am greatly sorry for their loss." Unfortunately for Aisha and her two young children, even a sincere apology would have come too late. Margo K. Lindauer, the Director of the Domestic Violence Institute at Northeastern University School of Law tells Refinery29 that she is horrified but not surprised at how the events unfolded. "We find that the most dangerous time in a relationship where there has been reported domestic violence is during a separation," said Lindauer. Aisha Mason filed for divorce after the assault in 2014 but at the time of her death it was still being finalized. "And men of status often receive leniency in sentencing." She points to the fact that the Mason's two young daughters were in the back of the car during the 2014 assault as well as the fact that police found a cache of weapons at Mason's home when arresting him that day — including smoke grenades, assault rifles, as sword, and a bulletproof vest — as serious risk factors that should have led to a much lengthier sentence. The presence of a firearm increases the risk of homicide in a domestic violence situation by 500%, according to the National Coalition Against Domestic Violence. But as a society we tend to treat domestic violence differently from crimes like drug possession or breaking and entering. In a sense we've normalized it, thinking of intimate partner violence as a "private" issue that shouldn't cause restrictions on one's liberty or professional success. "We’re so far behind in current practice committed to doing the right thing and offering legal relief for victims of domestic violence. We don’t have teeth as a society to enforce good behavior when others are behaving so badly and not seeing consequences," says Lindauer. "The role you play in society naturally expands to your private life — people deserve to be safe in their own homes." Now, Aisha Mason's family, friends, and colleagues are speaking out about her character — as her husband's cronies had rushed to do with him in 2014. “Aisha exemplified the best of Shaker Heights Teachers; smart, amazingly caring of her students and her colleagues, active in her profession and in Our Association. She is loved by many," the Shaker Heights Teacher's Association said in statement. They have set up a GoFundMe account with all the proceeds going to Aisha's daughters. Shaker Heights Superintendent Stephen Wilkins recalled Aisha as a devoted mother and committed teacher. The Cleveland Mayor's office has not responded directly to Refinery29's request for comment.